The memories will last a long time. 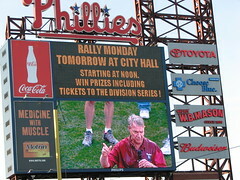 Here's a picture I took on the last Sunday game of the season long after the game was over a 'wet' Harry Kalas sings to us and tells us about the rally for the Phillies. Tune into the next show taping tonight on Halloween to hear James 'Jimmy Dogg' Mulry and Rich Baxter talk about the upcoming invasion by the Cowboys. Rich says it ain't going to be easy. We'll look at who the Phillies should add to the team via the free agency sweepstakes.